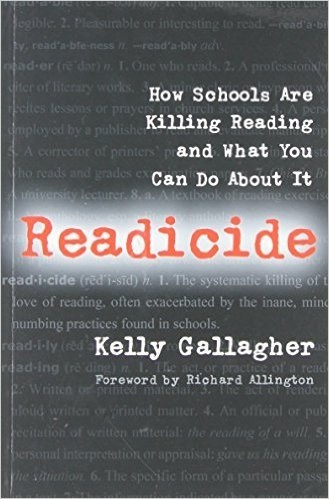 Readicide: How Schools Are Killing Reading and What You Can Do About It by Kelly Gallagher explains how most schools teach reading in a way that kills most students love of reading. It also gives advice on how to fix the problem. Educators at the middle school and elementary levels along with parents should read this. Read-i-cide: noun, the systematic killing of the love of reading, often exacerbated by the inane, mind-numbing practices found in schools. This is Gallagher’s proposed definition of the title of this book. In his 20+ years as an educator, administrator, and consultant, he has seen many teachers and administrators push practices that kill many students’ last chance to develop into lifelong readers. 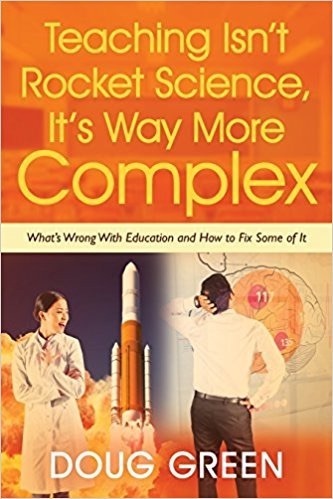 When most schools say they value reading, what they mean is that they focus intensely on raising state-mandated reading test scores. They feature the kind of reading that students will rarely if ever, do as adults. As a result, these schools are working against developing independent readers. Students who perform poorly, get more of the same ineffective treatment. Two-thirds of college-bound students still have to take remedial courses. If students are taught to read and write well, they will do fine on mandated tests. If they are only taught to be test-takers, they will never learn to read and write well. Standards are necessary, but the problem with state and local standards in the US is that there are too many of them. The biggest danger of sprinting though the content is that we graduate students who do not develop an interest in any content area. We have courses that are a mile wide and an inch deep. By sacrificing deep, rich teaching, we chip away at student motivation. We turn students into memorizers instead of thinkers. This entry was posted on Tuesday, June 8th, 2010 at 9:37 am	and is filed under Book Summaries, Education Books. You can follow any responses to this entry through the RSS 2.0 feed. You can leave a response, or trackback from your own site.